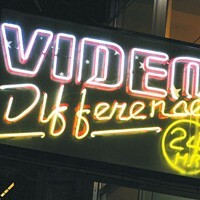 Editor's note: With its latest Best DVD Rental Store win in 2011, Video Difference was elevated to the Best of Halifax Hall of Fame. We have elevated Video Difference to the Best of Halifax Hall of Fame because it is the giant slayer, a killer of kings. Around this stalwart local business the international video conglomerates with locations within spitting distance of its Quinpool store---Rogers and Blockbuster---have folded: Rogers back to telecommunications, Blockbuster to that special hell where conservative entertainment chains that refuse to carry *The Last Temptation of Christ* go. How Video Difference continues to thrive is by offering things those other places wouldn’t or couldn’t; a staff that knows its way around the stock and specific knowledge of movies, lots of great snacks, a diverse selection of product---from classic horror to TV box sets to documentaries to foreign language gems arranged by country of origin. “A lot of what we bring is atmosphere,” says VD’s Tom Michael. “We recognize that if you choose to go out to rent a movie, you know your time is valuable and you’re discerning about you watch.” He says that in the battle with TV and online alternatives, the DVD rental outlet offers something special to film aficionados that they can’t find otherwise, a premium viewing experience of unique films. All this is available 24 hours a day, closing on December 24 to open approximately 12 hours later on Christmas Day. And you can be damn sure you can rent Scorcese’s moving Jesus movie for the occasion, if you’d care to. They have four copies.